I assume you have loaded your attachment into blender. Align (fit) your mesh to the Avatar. Select the Attachment and the Avastar Armature. Hint: Hover the mouse over the magnifier above to see where to find the Skinning Panel. 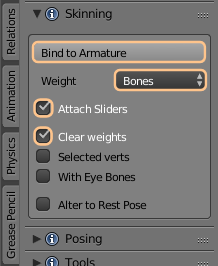 Remind: You must select the Armature AND the clothes that you want to bind. Copy weights from other meshes (see below). Exclude Eye bones from getting skinned. This is needed to avoid distortions on the mesh character caused by the animation of the eye bones. Meshes, if you want to copy from all other meshes which are bound to the same armature. You do this when your new meshes are significantly similar to already existing meshes for which you already have approved weights. For example you have created a weight template character for your projects, or your meshes are very similar to parts of the Avastar character. 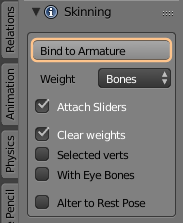 Bones, if you want to Automatic Weight from Bones algorithm (see Blender Manual: Groups_and_Parenting). This gives very smooth results in general. However the used method tends to spread the weighting too far away from the Joints. However, you can be sure that regardless of which choice you take, you will almost ever have to carefully check your animation and fix issues. The rest of this article is about how to manual fix weights. What to do when binding fails? Is your mesh made of multiple submeshes? Do you have intersecting faces in your Mesh? Do you have duplicate vertices in your mesh? 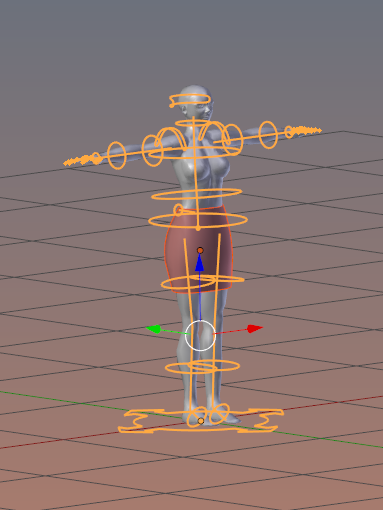 Often this problem appears when you Join separate Meshes into one mesh before you rig them. In that case you better rig the meshes first and join them later when the weighting is finished.. I assume you have got some mesh that you want to rig. I strongly recommend that you begin with something very simple, like the simple skirt that i will use in this documentation. Once you mastered the easy case, you are read to step into more complicated stuff.